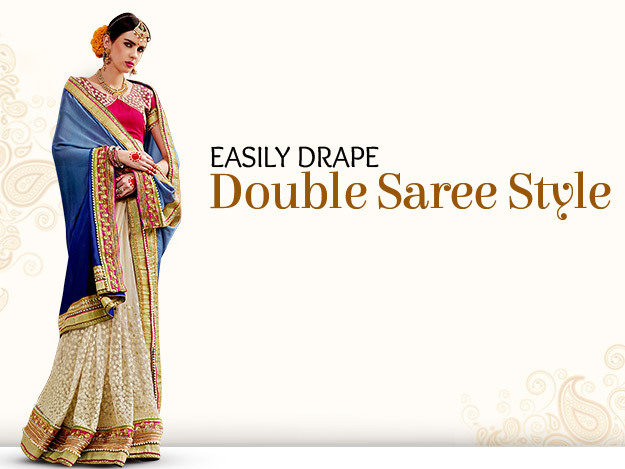 The Double Saree drape is a unique style, where you drape two Sarees seamlessly. 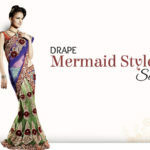 Given that double style Saree draping is a blend of modern and traditional, it is quite popular with fashionistas today. It is a sure shot fix to stand out even in a predominantly Indian setting. 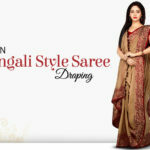 With this simple video, we resolve your queries about how to wear double style Saree. 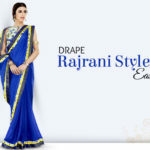 Here, we give you the essential guide to double style Saree draping steps. Let’s start with the first Saree: take one end of the Saree, make 6-7 pleats and tuck it in the centreof the petticoat. Ensure the tucked Saree falls just an inch short of the floor. Now, take the pallu end & make pallu pleats . Hold the pleats and from around the back bring it to the front. Take the pleated pallu, place it over the left shoulder, pin it up neatly and leave the pallu hanging. Now, let’s take the other Saree, make 6-7 pleats and tuck it in the center of the petticoatthat faces right & overlap the former Saree pleats. Balance the length of the pallu beforehand and pin it to keep it intact. Make sure to wear your footwear beforehand to get the right length of Saree. Always pin the Saree at 3 places – Waist pleats, Pallu pleats and Pallu to blouse/top. Add more pins, wherever required, depending on drape styles . Discover some of the finest Georgette and Brasso Sarees to drape this goregous style.